This new safe tool can monitor brain activity and actual brain treatments. The brain is as delicate an organ as it is powerful. Everything we can do is rooted in the brain – the human body’s built in neural network. When it malfunctions, for one reason or another, there are treatments available to fix the brain. One common tool is electrode wire, which can be implanted in the brain, usually as treatment for cases of epilepsy or Parkinson’s disease. While electrode implants are fairly common, current practice uses wires that are rather thick, measuring around 1.5 millimeters in diameter. These can sometimes hit blood vessels upon insertion, and even damage brain cells in the process. Furthermore, these electrode wires are also quite stiff and inflexible. They can also cause inflammation in the brain and, after a while, could become covered in immune cells that greatly reduce their efficiency. An even smaller and softer material is necessary. Enter carbon nanotubes. This futuristic material has certainly been making waves in the miniaturization of devices, from smaller transistors to gene editing tools. Carbon nanotubes are just a thousandth of the diameter of regular wires (or one-billionth of a meter). The only problem was that these are too soft, making them difficult to insert into the brain. “It’s like trying to stick a wet noodle into a bowl of Jello,” said Jacob Robinson of Rice University in Houston, Texas. 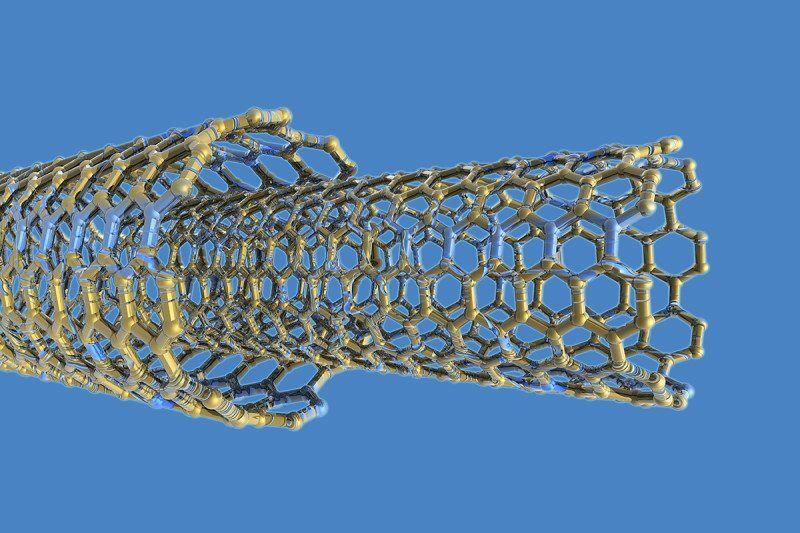 Rice University has been working on several projects involving carbon nanotubes. Fortunately, Robinson’s team was able to figure out a way to make carbon nanotubes temporarily stiff. The key was a device with a tiny channel of flowing water that fills up and stiffens the wire. The nanotubes do not bend or crumble upon insertion in the brain because the surrounding tissue helps keep them intact. The researchers were able to use the device to successfully implant nanoelectrodes in mice. Speaking at an IEEE workshop in San Diego last November, the team said there seemed to be no damage in the mice’s brains. Certainly, more tests will be necessary before the technique could be used in human clinical trials. It is a promising tool, with great applications in the treatment of neurological diseases. Furthermore, these nanoelectrodes can allow neuroscientists to study brain activity over longer periods of time. This is just one example of how nanomaterials are revolutionizing medical research and treatment procedures. This also isn’t the first time carbon nanotubes have been used in the brain. Previous research, also done in Rice University, has already established that carbon nanotubes make for superior links to the brain. It’s also been proven that these biocompatible nanofibers are the best candidates for safe electrodes that interact with the brain’s neural system. Due to their robustness and flexibility, these carbon nanotube fibers are bound to do much more for medical research in the future.